We start from scratch again: we have a canvas of dimensions \(C_w\) and \(C_h\) and we can \(PutPixel()\) on it. Say we have two points \(P_0\) and \(P_1\), with coordinates \((x_0, y_0)\) and \((x_1, y_1)\) respectively. Drawing these two points individually is trivial; but how can we draw the straight line segment from \(P_0\) to \(P_1\)? What is \(a\)? Because of the way it’s defined, it measures the change in the \(y\) coordinate per unit change in the \(x\) coordinate; in other words, it’s a measure of the slope of the line. This is the classic linear function, which can be used to represent almost all lines. It can’t represent vertical lines because these have an infinite number of values of \(y\) for one value of \(x\), and none for the rest. Somewhere in the process of obtaining this representation from the original parametric equation, these families of lines were lost; it happened when solving for \(t\), since we ignored the fact that \(x_1 - x_0\) could produce a division by zero. For now, let’s just ignore vertical lines; we’ll lift this restriction later. In this fragment, x0 and y0 are the \(x\) and \(y\) coordinates of P0; I’ll be using this convenient notation from now on. Also note that the division operator / is expected to perform real division, not integer division. This function is a direct, naive implementation of the equation above, so it clearly works; but can we make it faster? This shouldn’t be so surprising; after all, the slope \(a\) is the measure of how much \(y\) changes for each unit increment in \(x\), which is exactly what we’re doing here. Which means we can compute the next value of \(y\) using just the previous value of \(y\) and adding the slope; no per-pixel multiplication is needed. We need to start somewhere (at the beginning there’s no “previous value of \(y\)”), so we start at \((x_0, y_0)\), and then add \(1\) to \(x\) and \(a\) to \(y\) until we get to \(x_0\). The jagged appearance is due to the fact that we can only draw pixels on integer coordinates, and mathematical lines actually have zero width; what we’re drawing is a quantized approximation of the ideal line from \((-200, 100) - (240, 120)\)1. The algorithm is working as intended; it went from left to right, computed a value of \(y\) for each value of \(x\), and painted the corresponding pixel. The problem is that it computed one value of \(y\) for each value of \(x\), while we actually need several values of \(y\) for some values of \(x\). This is a direct consequence of choosing a formulation where \(y = f(x)\); it is in fact the same reason why we can’t draw vertical lines, an extreme case where there’s a single value of \(x\) with many values of \(y\). 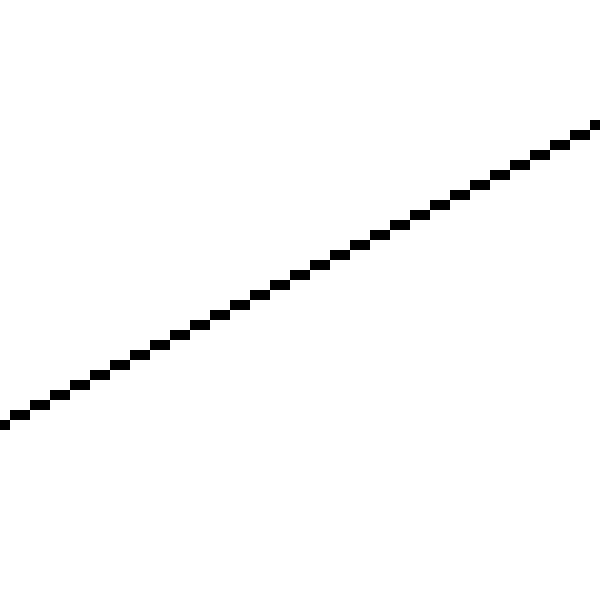 We can draw horizontal lines without any problem; why can’t we draw vertical lines just as easily? This is identical to the previous DrawLine, except the \(x\) and \(y\) computations have been exchanged. This one can handle vertical lines and will draw \((0, 0) - (50, 100)\) correctly; of course, it can’t handle horizontal lines at all or draw \((0, 0) - (100, 50)\) correctly! What to do? We just need to choose the appropriate version of the function depending on the line we’re trying to draw. And the criteria is quite simple; does the line have more different values of \(x\) or different values of \(y\)? If there are more values of \(x\) than \(y\), we use the first version; otherwise, we use the second. This certainly works, but it isn’t great code; there are two implementations of the code that computes a linear function incrementally, and this computation and the selection logic are mixed together. Since we’ll use linear functions a lot, separating the code is worth the extra work. We have two functions \(y = f(x)\) and \(x = f(y)\). To abstract away the fact that we’re dealing with pixels, let’s write it generically as \(d = f(i)\), where \(i\) is the independent variable, the one we choose the values for, and \(d\) is the dependent variable, the one whose value depends on the other, and we want to compute. In the horizontal-ish case \(x\) is the independent variable and \(y\) is the dependent variable; it’s the other way around in the vertical-ish case. Note that the value of \(d\) corresponding to \(i_0\) is in values, the value for \(i_0 + 1\) is in values, and so on; in general, the value for \(i_n\) is in values[i_n - i_0], assuming \(i_n\) is in the range \([i_0, i_1]\). While this version isn’t much shorter than the previous one, it cleanly separates the computation of the intermediate values of \(y\) and \(x\), and the decision of which is the independent variable plus the drawing code itself. The advantage may not be obvious, but Interpolate will be reused heavily in later chapters. Note that this is not the best or the fastest line-drawing algorithm; the important product of this chapter is Interpolate, not DrawLine. 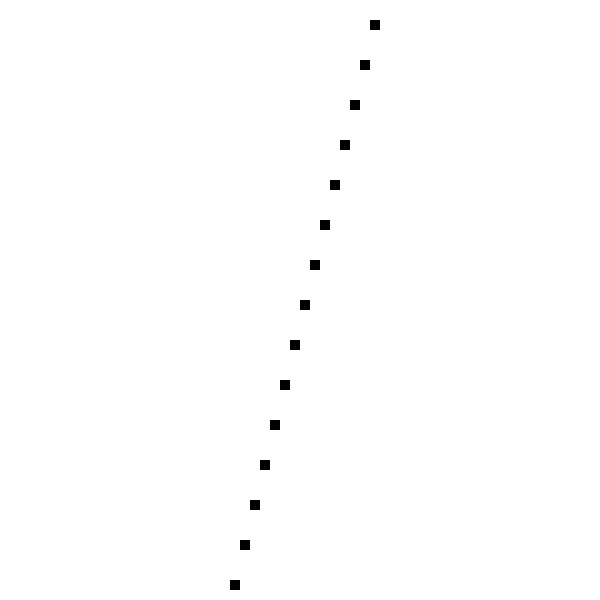 The best line-drawing algorithm is probably Bresenham’s. Found an error? Everything is in Github.